Trimble is a leading provider of advanced positioning technology and mobile solutions whose products are used in over 141 countries. Founded in 1978, the company integrates global positioning software (GPS) and other technologies and services to provide commercial solutions for a variety of industries, including agriculture, engineering and construction, transportation and wireless communications infrastructure. Based in Sunnyvale, California, the company has offices in 35 countries and works with partners and dealers worldwide. Trimble reported $2.3 billion in revenue for fiscal year 2013. In 2012, Trimble purchased SketchUp from Google to provide 3D models and tools to the architecture, engineering, and construction (AEC) community. Users can search and download models from the 3D Warehouse website or using SketchUp’s desktop application. Trimble planned to add 3D Warehouse to its Design Build Operate (DBO) platform, which would allow customers to use the 3D models with other Trimble tools to collect data, design, model, and collaborate on a single, web-based platform. After the purchase, Trimble needed to move the website and application to its environment. SketchUp includes more than 2.5 million 3D images, which Trimble had to convert to a format compatible with its own software and applications. The Trimble team wasn’t sure how much storage the models would require or what the workload would be to run the website. Needing flexibility, the ability to scale, and storage capacity led Trimble to consider a cloud-based solution. Trimble runs the 3D Warehouse website application using MySQL on Amazon Elastic Compute Cloud (Amazon EC2) instances. With the exception of rendering servers that use Microsoft Windows Server 2000 for a 32-bit application, Parker estimates that most instances are using Linux Amazon Machine Images (AMIs). Trimble uses Elastic Load Balancing to distribute workloads across instances. 3D Warehouse is a CPU-intensive application that runs about 27,000 bits per minute, so the DBO team migrated the application in stages to check the workload. Trimble operates its primary environment out of the US West (Oregon) Region in a single Availability Zone. The DBO team replicates the environment in the US East (Northern Virginia) Region for disaster recovery. Trimble typically runs on two applications servers and two Solr servers, and scales to as many as five application servers when troubleshooting applications. Trimble uses Amazon CloudFront for worldwide content delivery. “CloudFront has been effective in helping us handle our load,” says Parker. “We’re in every CloudFront edge location, which allows Trimble to operate in a single region and scale to meet worldwide demand.” Figure 1 demonstrates Trimble’s environment on AWS. The 3D warehouse application hasn’t had any downtime since moving to AWS, providing a robust environment for Trimble’s customers. “We’re planning to move to multiple Availability Zones to help us grow the way that we want,” Parker says. 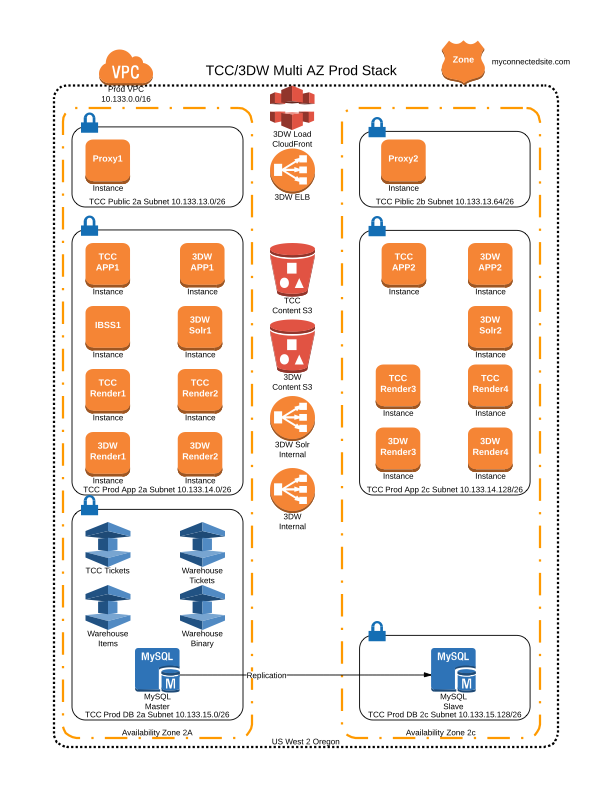 To learn more about how AWS can help you run your web applications needs, visit our Web, Mobile, and Social details page: http://aws.amazon.com/web-mobile-social/.